With a New Year just around the corner, chicken keepers know that temperatures are going to drop; with the usual wind and rain of autumn and early winter soon to be accompanied by an icy chill. This decline in temperature usually witnesses some changes in human behaviour, with smallholders around the country digging out their thermal clothing, cranking up the heating in their homes and donning woolly hats whenever they have to venture outdoors. For free range chicken keepers this change in temperature also necessitates modifications in the care of their birds, to ensure that a flock’s productivity and well being are maintained throughout the cold winter months. One of the most significant alterations required is to increase the level of feed provided to free range birds, with the cold weather having a significant impact on a chicken’s nutritional requirements. Chickens are very good at maintaining a comfortable body temperature but when climatic conditions get colder, in order to do so, they become increasingly reliant upon extra food to help maintain this temperature level and continue to produce eggs. When temperatures fall, free range birds will prioritise where they expend the energy they obtain from feed; diverting energy away from producing eggs and towards helping regulate body temperature. As a result, if extra feed is not provided to chickens during cold spells, egg production and egg quality can suffer. In order to compensate for this, it is estimated that for every 1 degrees (C°) drop in temperature, free range birds should be provided with an extra 1g of feed a day. This may not seem like a lot, but if one owns a lot of free range birds, or if cold temperatures continue for a long time, there can be significant implications; both in terms of how much physical feed one needs to store and overall financial cost. 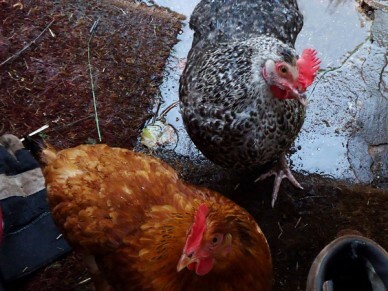 Another basic requirement is to ensure that chickens have constant access to fresh, clean water and when the mercury levels drop, this results in more work for the free range chicken keeper. There are various heated pads and water basins that can be purchased to ensure that water supplies don’t freeze over, but this won’t always be practical due to the location of a free range flock and the cost implications of providing and maintaining an electricity supply. Unfortunately, for most small scale keepers the low cost, low tech alternative involves regularly traipsing back and forth from water supplies and breaking any ice that has formed. One useful tip is to place a table tennis ball (or several) in water bowls used by chickens; the theory being that any ice that forms around the balls will be weaker and allow birds to peck through and access the water. When the weather gets extremely cold, one also has to be aware of chickens suffering from frostbite; particularly in their combs and wattles (the flaps of skin below a bird’s beak). The wattle and comb of a chicken represent the most exposed parts of bird and those most susceptible to frostbite. Whilst conditions rarely get bad enough to worry about frostbite in the UK, with increasingly colder winters, it is important to be aware of this potential problem, especially if chickens have large combs or cold, wet weather is combined with strong winds. If required Vaseline can be applied to a bird’s comb when chickens are put away for the night, with the lubricant providing an additional layer of protection through the night and into the next day. Alterations can also be made to chicken houses to enhance the comfort of chickens at night, with the allocation of extra bedding and exclusion of draughts being of real benefit. 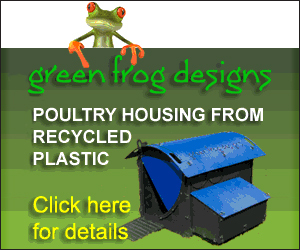 If using a traditional chicken house it is wise to provide a deeper level of litter than usually utilised, thereby providing an additional contribution to insulation. This litter should also be cleaned out more regularly than usual as it is inevitable that during the winter months, bedding will become damp with rain water and mud, with associated health implications for birds if left unattended. It’s also worthwhile spending time ensuring that sources of potential draughts in chicken houses are located and repaired to prevent chickens becoming chilled. However it is important to make sure that a flock’s night time accommodation stays well ventilated. With fewer daylight hours during winter, damp, muddy, free range chickens will be spending an increasingly large amount of time indoors and it is important air circulates to help dry birds and prevent the build up of mould and damp. By being aware of the points raised above, free range chicken keepers can ensure that the birds within their flock are provided with a level of care that will ensure maximum productivity and wellbeing during the coming, cold winter months. Poultry keeper James Marshall will often be found writing about farming and the countryside on his blog Outdoorsandmore. thanks for the helpful information helped me a lot. Thanks for all the great information. I wondered if you could help me please as this is my first year having hens. We have 5 hens that are in a very secure enclosure with the hen house in the centre. Up until now I have been leaving the door to their house open and they can go in and out as they please. Should I start to close this now it is getting colder or is increasing their food and straw bedding sufficient for keeping them warm in the winter months? As long as you are happy that the immediate problem of predation is adequately covered by the main enclosure and that there won’t be a draught blowing in the door when the winds get up they will be perfectly happy and warm enough snuggling up with each other on the perch. Draughts are more of a problem than you might imagine though so definitely make sure the coop is ventilated but draught free.